Christmas 2015 found UBC Mechanical Engineering graduate Andrea Palmer-Boroski in Santiago, Chile. As founder and CEO of the UBC startup company, Awake Labs Inc., Andrea went to Santiago to participate in a government-run innovation program called Startup Chile, with the intention of producing a “minimum viable product” (MVP) version of her company’s planned signature product, Reveal. Reveal is an unobtrusive, medallion-like sensing device worn under clothing such as a sock that detects skin temperature, heart rate, and sweat levels as indicators of anxiety, initially targeting individuals with autism spectrum disorder (ASD). Anxiety often precedes a “meltdown” among those with ASD; if a parent or caregiver can intervene quickly enough to implement a calming strategy known to work for the individual, the meltdown can be averted. The intervention window is often lost, however, since people with ASD tend to have difficulty relating to their emotions, and so may not communicate their distress. Reveal uses Bluetooth to send an alert to the caregiver’s smartphone, when anxiety indicator levels point to a looming meltdown for the person wearing the sensor. The device’s machine-learning algorithm also incorporates expert knowledge about these levels, and becomes increasingly sophisticated with use. “Reveal is designed to be trained with constant input from the caregiver,” Andrea says. “They can differentiate between stress caused by physical activity, happy excitement, or unhappy anxiety.” By harnessing physiological data, both from individual responses and research datasets, Reveal adds an evidence-based dimension to coping with ASD, in addition to the qualitative, observational data that management has traditionally been based upon. The Awake team hopes that in the long run, Reveal will enable those with ASD to use the device themselves to “self-regulate,” and implement their calm-down routines when triggered to do so. Andrea has pursued a unique path since completing UBC’s Engineering Co-op program in April 2015, made possible by entrepreneurship programs available to her at UBC, and by meeting the right people along the way. As a robotics and mechatronics student in Mechanical Engineering, she took the New Venture Design course, which teamed her up with two students from engineering, two from business, and one from economics to devise a product prototype and develop a business plan to bring it to market. The team knew from the outset that they wanted to help people by pursuing a social venture, and initially conceived of a device to detect stress and anxiety levels in the workplace. They had the opportunity to work with UBC biomedical engineering professor, Agnes d’Entremont, who suggested they look at people with dementia or ASD. This suggestion resonated with several team members who had been touched by autism, and the team settled on Reveal as their project. 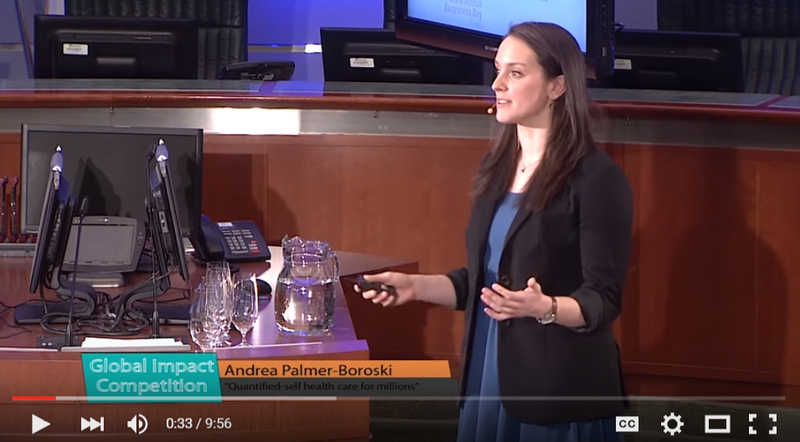 The promise of Reveal was recognized in April 2015 when Andrea’s pitch won Canada’s second annual Global Impact Competition (GIC). The GIC, held in 44 countries, identifies remarkable entrepreneurs, scientists, leaders, and engineers whose innovation is most likely to have a positive impact on 1 million people within 3 to 5 years in their home country. The winner is awarded a scholarship to attend a 10-week intensive graduate program at Singularity University in Silicon Valley, to accelerate development of their innovation. Andrea was one of 80 participants selected from 5,000 applicants worldwide, and took part in the program in the summer of 2015. Among other changes, the experience made her think longterm and on a scale exponentially larger than she had previously. Andrea is forever grateful to Sauder School of Business/Mechanical Engineering lecturer Tamara Etmannski, Canada’s inaugural GIC winner; New Venture Design instructors Paul Cubbon and Blair Simonite (entrepreneurship@UBC Program Director); and Applied Science professors Mike van der Loos, Antony Hodgson, and Philippe Kruchten, for helping her get there. Now with startup space in UBC’s Alumni Centre provided by entrepreneurship@UBC, the Awake Labs team is engaging with families caring for children with ASD, and with researchers in the field, to refine Reveal. They will conduct pilot studies in the near future, then take Reveal to market. Reveal also has potential applications in post-traumatic stress syndrome (PTSD) and in generalized anxiety, where it could allow individuals suffering from these conditions to implement their own coping strategies once their heightened anxiety levels have been signalled. In another application area, Reveal could trigger an anxiety alert when a person suffering from dementia is losing their train of thought, so that caregivers could steer the conversation in a more comfortable direction. With its capacity to improve the lives of millions of people, Reveal is the right vehicle for effecting large-scale positive change in the world. For more information, go to Awake Labs.